Peaceable Kingdom is a world class documentary. The outstanding, high quality of the directing, photography, and editing draws the viewers into the emotions expressed by both the humans and the animals filmed. This opinion was amplified by the sell-out crowd who attended the premier showing at Lincoln Center in New York City. For years, we've been speaking and writing about the way societal peer pressures have been systematically hardening the hearts of our children against feeling the pain and suffering of the whole of creation, until they accept cruelty and suffering as a way of life for all but those in their own sphere of compassion. 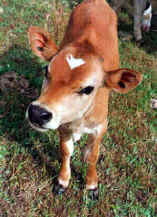 Through the eyes and words of several people and animals who have lived both sides of this issue, Peaceable Kingdom exposes this underlying cruelty in our society, and directs us back to compassionate living. Every religious leader and every congregation should see Peaceable Kingdom, for it shows us the way to the Peaceable Kingdom described by Isaiah in 11:6-9. 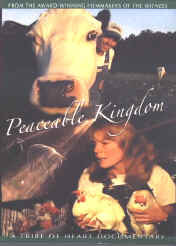 At a time when the public is more concerned than ever about the health and environmental problems associated with large-scale factory farming, Peaceable Kingdom explores another angle of this unfolding story: the interconnected life journeys of farm animals, former farmers, and animal rescuers struggling against an out of control industrial system. Breaking generations of silence in the farm community, Peaceable Kingdom weaves together themes of respect, forgiveness, commitment, and healing, offering a vision of a more peaceful world that is well within our reach. We recommend Peaceable Kingdom to everyone. It is an outstanding resource for group viewing and should be part of every private and public library. 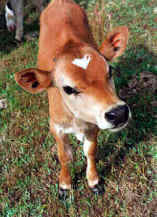 We all need to be part of the Peaceable Kingdom.